We are just finalising the user guide and adding support for streaming of your iTunes music and videos to additional DLNA devices (more brands of TVs). So version 3 of iHomeServer will be available to everyone within a couple of weeks. Streaming of your iTunes music and videos using DLNA to Smart TVs, Windows RT Surface (using our rtRemote product available in the Windows app store), Android Smart Phones, and many many more. We recently released an update of our Windows Store app for remotely controlling your iTunes library directly from the Windows 8 interface. The update adds support for new Windows 8.1 features such as the in-app search bar, new app size modes, improved network compatibility as well as some bug fixes. rtRemote is the only app available for Windows 8 that provides similar functionality of the Apple Remote app for iOS devices – it turns your Windows Surface, PC or laptop (inc Windows RT) into a remote control for your iTunes library. So wherever you are at home, you can use your Windows 8 device to browse through your iTunes library, select a song or movie and play your music / films / etc to play on your Apple TV or AirPlay compatible speaker(s). This release of rtRemote also includes a new killer feature called ‘Play Here’ that will let you stream your iTunes media library music and video directly to your Surface or other Windows 8 device – this unique functionality is powered by iHomeServer v3 so is currently only available to users of the iHomeServer v3 beta but will be available to all iHomeServer users when v3 is released. First, ignore the 'it doesn't have airplay' review as this is an iTunes remote app, not a streaming player. that said, it can control airplay settings on the iTunes library you are controlling! its so amazing I had to get a surface to have Office for work and was so worried it wouldn't give me control over iTunes on my home network like an iOS device would but it does, and the User Interface is soooo amazing. This dev can make an app! If you are coming from a Mac/iOS background will love it! Just a quick post to point out a couple of interesting things when upgrading to iTunes 11.1. "The image file xxxx\iTunes64Setup.exe is valid, but is for a machine time other than the current machine"
Note that Apple still doesn't support running iTunes on WHSv1 so you may receive an error saying "Apple Mobile Device Support requires that your computer is running Windows XP SP2 or newer". If you do (which you probably will on Windows Home Server v1), then don't forget about our free tool which modifies the iTunes install package to enable running on WHS no problems :) - we've retested this for iTunes 11.1 and it's good to go. iHomeServer v3 has started beta testing! We haven't posted for a while, however, want you to know that we haven't been sitting back relaxing. Instead, we have been working hard on the next major release of iHomeServer - version 3. Version 3 will continue to do all the great things that many of you have come to appreciate with iHomeServer v2, however, will add a LOT of new features. We feel these features will be equally useful to desktop and server users alike and therefore the release aims to make iHomeServer more accessible for desktop users who have a single computer and run iTunes on it. They can then take advantage of existing features such as Watch Folders and the advanced metadata editing facilities we have built into iHomeServer in addition to all the new bells and whistles which we have built on top of the iHomeServer framework. So what's in the new release? At the moment, this is a closely guarded secret so you'll have to wait a few more weeks, however, I hope you will be pleased with what we have added. Beta testing is currently by invitation only, therefore there is unfortunately no public link available today. However, within the next couple of weeks we will open up the beta to everybody. In the meantime, if you are particularly interested to get your hands on the latest release, drop us a mail at the usual address - support@bizmodeller.com. Just a quick note to confirm we have released iHomeServer 2.2.35.0 recently which adds formal support for iTunes 11 and Windows Server 2012 Essentials. Close iTunes and restart your computer. Reinstall the latest version of iHomeServer and enter the same user account details you were originally using in order to restore your settings. We are getting a lot of emails about iHomeServer support for iTunes 11 so thought it was best to write a quick post on the current status. iTunes 11 is not yet officially supported as we are still testing iHomeServer with iTunes 11 - however, we have so far found no problems. We have also had a large number of existing and new users who have confirmed they have upgraded and seen no issues using the latest iHomeServer release (2.2.23.0) with iTunes 11. All key features (watch folders, AirPlay, Wifi sync, etc) should work ok.
We have, however, received two reports of issues which we are still trying to replicate. Both relate to iTunes crashing within a few minutes of being started by iHomeServer due to a crash in webkit.dll. These may be isolated incidents, but we are investigating further before stamping iHomeServer as iTunes 11 compatible. We may revise these instructions however, they should reduce the risk of any issues during the upgrade. Please post your experiences with iHomeServer and iTunes 11 as a comment below. Just a quick post to let you all know that we are actively working on some exciting developments and approximate timescales for up and coming releases. Those of you who have used Windows Home Server as your server platform will no doubt have heard the news that Microsoft is ending the Windows Home Server line and instead replacing it with Windows Home Server 2012 Essentials at a much higher price. Many users will likely migrate over to Windows 8 instead due to its significantly cheaper price point. Fortunately, iHomeServer is now supported under Windows 8 and provides an excellent platform upon which to run a standalone headless instance of iTunes on a Windows 8 based desktop or home server. The latest version of iHomeServer (2.2.23.0 at time of writing) installs as a desktop app on Windows 8. For those of you who have used Windows Home Server previously, the iHomeServer tabs you see in the Windows Home Server Dashboard are available under Windows 8 in a dedicated management console called the 'iHomeServer Management Console' available in the Windows 8 Start Menu. We are also working hard to provide iHomeServer support for Windows Home Server 2012 Essentials. Note that, whilst not supported, the current version of iHomeServer should install on this platform, however, the add-in interface is not yet available in the current release. So, as with Windows 8, you will need to configure and monitor iHomeServer using the iHomeServer Management Console application installed in the Start menu. We are planning to release an update to iHomeServer to provide Windows Home Server 2012 Essentials Dashboard support very shortly. Please note at we have no plans to stop supporting Windows Home Server v1 and Windows Home Server 2011 at the current time! We have just updated the beta release of iHomeServer 2.2 to add support for content rating (eg PG-13, R, etc), the HD flag and extended iTunes properties such as Cast, Director, Producer, Studio, etc. These properties aren't directly accessible within iTunes, however, are usually set on media you download from the iTunes Store. iHomeServer now brings these tags to all your media! Most of the tags are displayed on Apple TV; a subset are also displayed on iPhones/iPads. iHomeServer allows these to be set in the normal metadata editor (which you can get to by double-clicking a file in the Watch Folder view, or selecting 'Get Info' from the right-click menu on either Watch Folder or iTunes tabs). The extra fields are on the 'Video' tab - see http://www.bizmodeller.com/ihomeserver/userguide/edit_track_metadata_window___video_tab.htm for more info. 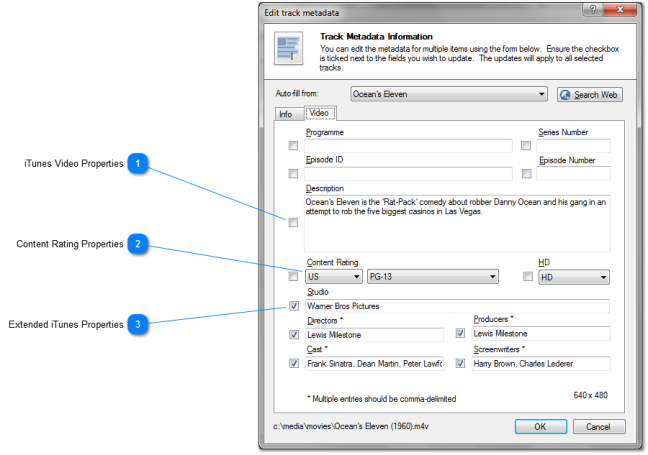 The additional metadata properties are also supported by AutoTag. Content Rating allows you to apply a rating tag such as PG-13, U, R, TV-14, etc to your media. Our implementation is particularly flexible because iHomeServer allows you to specify your preferred content rating system - eg the content rating for your own country (where supported). The HD flag will now automatically be set for any movies whose vertical resolution is 720 pixels or greater. As always, the beta is available from our beta web-page.